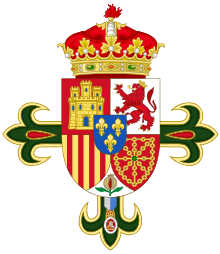 Infante Alfonso of Spain (Don Alfonso Cristino Teresa Ángelo Francisco de Asís y Todos los Santos de Borbón y Borbón Dos-Sicilias; 3 October 1941 in Rome – 29 March 1956 in Estoril) was the younger brother of King Juan Carlos of Spain. When Alfonso was still just a baby, his family moved to Lausanne in Switzerland where they lived in the Villa Les Rocailles. In February 1946 the family moved to Portugal. In 1947 Alfonso visited Spain for the first time at the invitation of dictator Francisco Franco. In 1950 he and his brother Juan Carlos were sent to study in Spain. At first they lived in San Sebastián where a private school had been established in the Miramar Palace. In June 1954 they were received by General Franco at the Pardo Palace. Later Alfonso and Juan Carlos attended the military academy in Zaragoza. 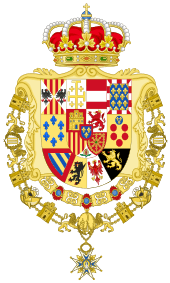 It is alleged that Infante Juan, Count of Barcelona, the children's father had thrown the gun into the sea sometime after Alfonso's death. ↑ José María Zavala, Dos infantes y un destino (Barcelona: Planez & Janés, 1998), 101. ↑ "Spanish Pretender's Sons", The Times ( 2 October 1950): 3. "General Franco and Don Juan", The Times ( 3 October 1950): 5. ↑ "Prince to Return to Spain Tuesday", The New York Times ( 16 January 1955): 25. ↑ Quoted in Paul Preston, Juan Carlos: Steering Spain from Dictatorship to Democracy (New York: W.W. Norton, 2004), 101. ↑ "Royal Foibles". Retrieved 2014-06-05. ↑ "Juan Carlos lays to rest a haunting Spanish tragedy". Retrieved 2014-06-05. ↑ A Royal Mystery at Snopes.com.